Originally from Houston, Texas, Robert Flores graduated from the University of Houston in 1992. Since March 2005, Robert has worked at ESPN in Bristol, Connecticut. 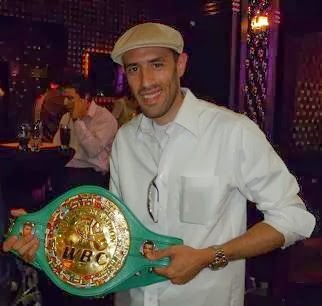 It is a real pleasure to interview him on my Boxing Blog. Question: Robert, how did you get into boxing? Answer: "My dad and grandfather were big boxing fans. Growing up, we spent weekends watching boxing on television. I think I was lucky to grow up in the 70's and 80's. It was one of the greatest eras in the sport, and some of the biggest fights were on television more frequently then now." Question: What's been your favorite assignment on ESPN? Answer: "I think anchoring Sportscenter has been the biggest thrill of my professional career. It's the flagship show of the company." Question: Can you describe your thoughts on the recent tragic deaths of Alexis Arguello and Arturo Gatti? Answer: "Obviously, both were tragedies made even more tragic by the surrounding circumstances. Boxing lost two great warriors." Question: What is your first thought or fondest memory of Arguello and Gatti? Answer: "When I think of Alexis Arguello, I think about his two fights with Aaron Pryor, especially the first one in 1982. I remember watching that fight on HBO. The great Barry Tompkins had the call. It's one of the best fights in history. I think I'm like most boxing fans, when I think about Arturo Gatti, I think about Micky Ward. Speaking of HBO, I believe they aired the entire Gatti/Ward trilogy this weekend in honor of the late Arturo Gatti." Question: Who do you feel boxing's biggest draw is right now? Mayweather, Pacquiao or someone else? Answer: "With apologies to my man "Money May", boxing's biggest draw right now is Manny Pacquiao." Question: If you weren't at ESPN, what would you be doing? Answer: "I've wondered about that....I think I would pursue a career as a basketball coach." Question: Do you feel boxing will ever have a national commission in this country? Answer: "Unfortunately, no. Too much money and too many promoters often become a negative for the sport." Question: What are your thoughts on Mayweather vs. Marquez? Can Marquez pull off the upset? Answer: "I think he can, especially in light of Mayweather's layoff and rib injury. Marquez is at his best when he's facing adversity, so Mayweather's speed won't rattle him. However, I'll still take Mayweather by decision." Question: What's your most memorable fight on "Friday Night Fights"? Answer: For some reason, this fight sticks out in my head, but not for the reason you think. Back in April, Demarcus "Chop Chop" Corley fought Hector Sanchez. Corley came into the ring wearing the "Predator" mask. I mean it was authentic, looking exactly like the movie. The fight went the distance and afterwards, Corley put on the mask again. He lost by decision. It was just hilarious to see his reaction to the decision with his mask on. I guess you had to be there." Question: Who is your all time favorite fighter and why? Answer: "Muhammad Ali. I was a huge fan of his growing up. My favorite Christmas was the year I got the Muhammad Ali Boxing Ring. He meant a great deal to the sport and had a huge impact both in and out of the ring. There was a time, when the most famous athlete in the world was a boxer. Unbelievable right?" Answer: "I enjoy playing pick up basketball, running, reading and video games...having two sons certainly feeds that habit." Question: What are your top 5 all time favorite fights? Answer: "Leonard-Hearns I, Holmes-Norton, Arguello-Pryor I, Gatti-Ward I and Foreman-Moorer (just because it was so unexpected)"
Question: If you could see one fight made in boxing right now, what would it be? Question: Lastly, what's the one fight you would have liked to see, but for one reason or another, never took place? Thank you, Robert. I really appreciate the time you took to do this interview with me! Nice job Mike I really enjoyed the interview. Oh and by the way I have the Ali Boxing ring mentioned in the interview I bought it for Mr. P many years ago. That was a blast from the past. Great job landing a interview of that nature. Did you post it on yardbarker/ballhyde?